ReapAir is a dedicated supplier of a full range of air compressors. Our product line is constantly updated with the latest, top-notch and most efficient in industrial air compressor needs. 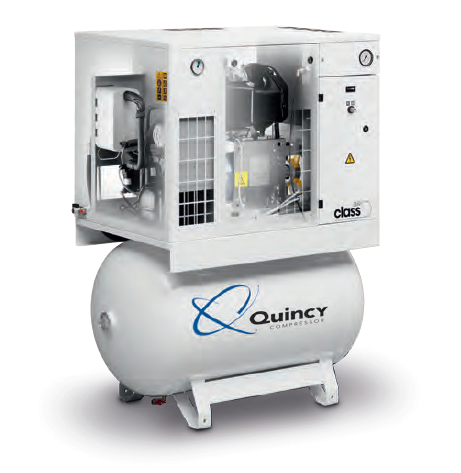 We stock various types of air compressors and parts, including Quincy air compressors like the reciprocating piston and lubricated rotary screw models that give this brand its sterling reputation. We provide more than just the best products for your enterprise’s industrial air compressor, but also offer energy saving solutions. In addition to energy efficiency and air leak detection programs, we also provide variable speed compressors, repairs, maintenance and parts supply. The Quincy QGV Series rotary screw air compressors (40-60 HP), for example, offers the advantages of a variable speed drive for applications where the demand for compressed air fluctuates. Compared to their previous versions, these next-generation industrial air compressors are 10% more efficient. This is due to the following features of Q-Control. The cutting-edge compressor controller software of Quincy’s Q-Control provides a lot of benefits to customers such as improvements on user interface, reliability and energy reductions utilizing the improved control algorithms. New onboard tools including basic remote monitoring, networking and cellular connectivity made optimization and connection easier. The total package includes built-in intelligence, full-color display, real-time trending on controller screen, day/week organizer, dual pressure band, graphic service plan indicator and networking up to 6 compressors. You can monitor the status of your industrial air compressors via online visualization over your local area network connection. It works for free while letting you enjoy the amazing features of shutdown and maintenance scheduling and warning indications. Q-Connect is an inclusive free service feature that offers effective monitoring through online service performance dashboard, machine service status, and monthly service emails. The standard Q-Control package comes with a cellular hardware device. You also have the option to avail the additional paid features of the program which include text messages, emails and maintenance pre-alerts. There is also an optional gauge control for QSI, specially for harsh applications. The three gauges include pressure, percent capacity, and temperature protection. The silicon-dampened dashpot movements allow accuracy of liquid-filled gauge preventing potential leak.